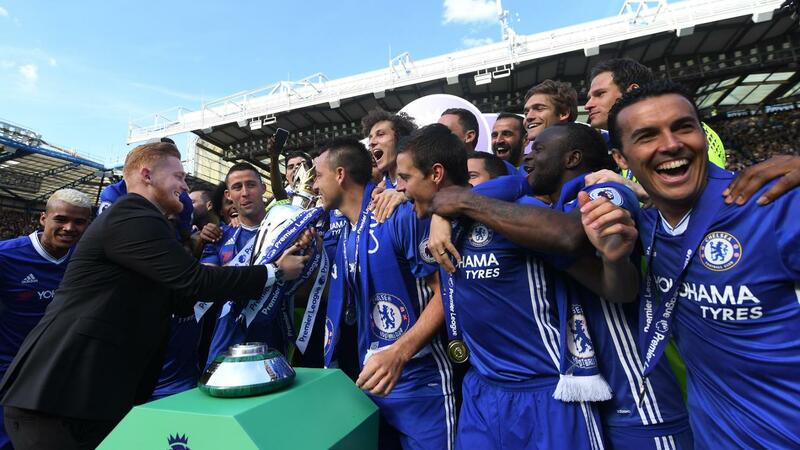 Two weeks ago, in his role as Chelsea's Premier League Kicks Hero, Tom Horrigan had the honour of presenting the Premier League Trophy to John Terry and Gary Cahill as the team celebrated their title triumph at Stamford Bridge at the final match of the season. Tom describes his memorable day. "I woke up at around 9am and although the trophy presentation was only a few hours away, I wasn't too nervous, I was more happy and excited. "I spoke with my aunty on the phone and she was crying with happiness, saying how proud she was of me. "I put on my new suit that Chelsea helped me to buy since I didn't have one for the occasion. That was a great gesture from Chelsea. "My girlfriend had collected it the day before because I was busy in my role as a PL Kicks coach for the Chelsea Foundation. "I had to be at Stamford Bridge at 1pm so left my home in Putney at midday to make sure I was early. One of my mates picked me up and we made our way to meet other friends at the ground. "At the stadium, I met the organisers of the trophy presentation and chatted with Premier League Executive Chairman Richard Scudamore, who was doing the presentation with me. "Having done many of these presentations he told me not worry and that it would be fine. He made it sound so much better and it made my nerves go. "I was able to enjoy the game. I just tried to embrace the whole thing. Then with about 10 minutes left, I was collected and taken down to the tunnel. 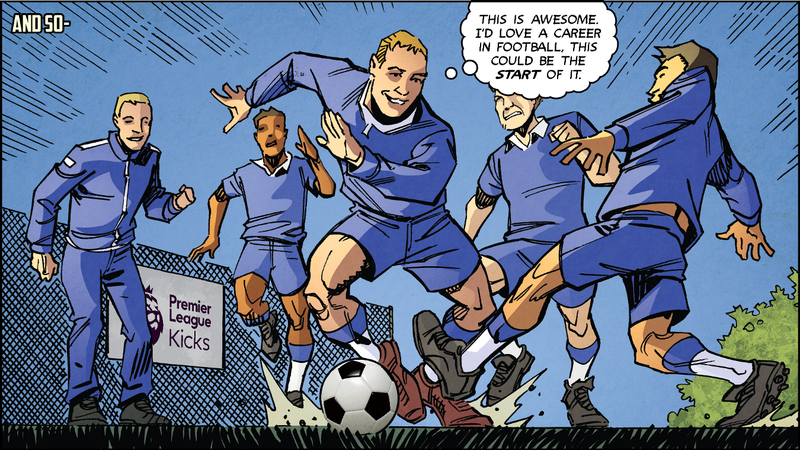 "I met Dennis Wise and talked about my story with PL Kicks, and how it helped me keep out of trouble when I started nine years ago as a 12-year-old in south London. "We watched the final few minutes of the match on the TV. Then we went out into the tunnel, walking past the players as they went back to the dressing room. "A video of my story, going from being a PL Kicks participant to becoming a qualified coach, giving advice and guidance to other young people, was played to the crowd on the big screen. "I peeked my head out to watch. It was surreal. A few people in the crowd were shouting my name and saying, 'Well done.' The atmosphere was buzzing. "Then it was time to go out on the pitch. Dennis walked out with the trophy and I followed. "A few months ago I was presented with the Peter Osgood award for my work with PL Kicks but I never felt like I took it all in, because I was nervous and shy. "I made sure that this time I didn't do that again. "I was looking for my friends and my mum and dad. It meant so much to have them there because they got to see what I was doing in the flesh. "The presentation itself all happened so quickly. I was so excited. Richard and I were putting the medals over the necks of the players and shaking their hands. "It was now time to hand over the trophy. I grabbed it, made sure everyone was ready and gave it to John Terry. After that, it was crazy. Fireworks and confetti going off, it was amazing. I couldn't believe what I had done. "At first I was not sure if I was allowed to join in with the celebrations but I was told to just to go out there and enjoy it. I didn't need to be told twice! "I spoke to players and asked for photos. I chatted with Michy Batshuayi, Nathan Ake, Gary Cahill, David Luiz. "It was very special to be on the pitch. I really felt part of it, like I had won the Premier League as well. It was a proud moment. "My phone was going crazy from the moment I handed over the trophy to when I got home. I didn't reply that night because if I replied to one message, I would have had to reply to them all! "I then went out with my mates to chill but I was still buzzing. I couldn't go to sleep. "It's the best thing that has happened to me football-wise. Not many people can say they have presented the Premier League Trophy. I'm so proud, happy and thankful to everyone."